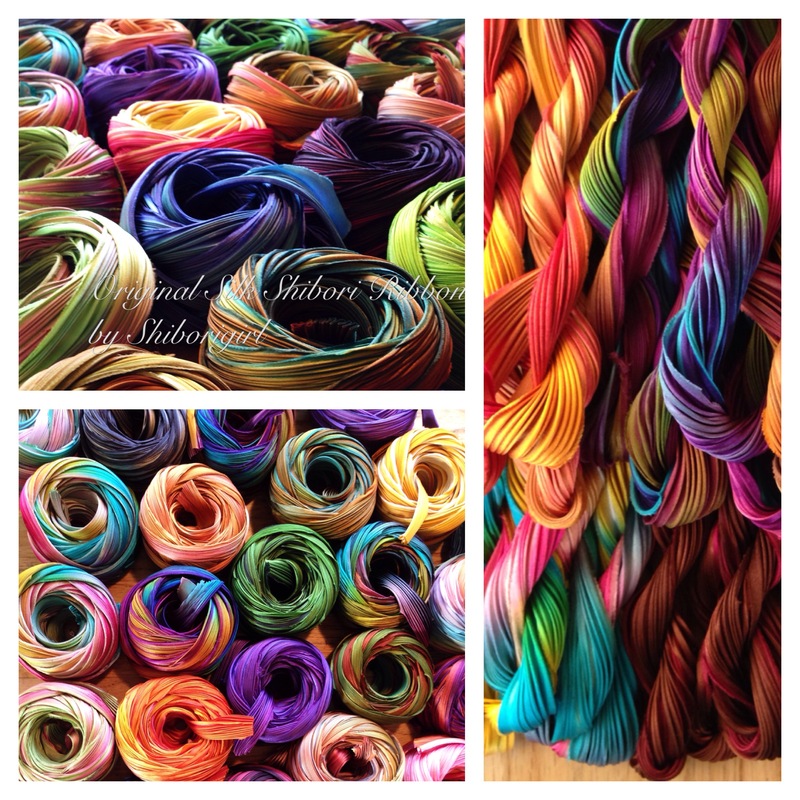 As a practitioner of shibori dyeing and maker of silk shibori ribbon for over ten years now, I continue to wonder about what I do for a living, and why. It’s a good thing to wonder about consciously in order to keep ahead of things and remain independently viable. –I was born to work with my hands and to make things. This has been true since I was a child and cannot be removed from who I am, except perhaps by a lobotomy. I learned at an early age I felt better when being creative and productive making things by hand and later on learned I also did enjoy the marketing of my own work,even though I hated it in the beginning and remember crying in my ’69 VW bug after an unproductive day of sales calls and appointments -I was about 19 at the time. I persisted. Forty years later now, I do it from behind a computer and the rare consumer trade show. –I seem to have a knack for creating things that others want to buy, and in enough quantity that at times I have had to employ quite a number of others to participate in this unlikely form of employment. I found a certain joy in being able to provide a living for others in addition to myself in handmade craft here in California. It has been an honor really-because of the people I worked with. Eventually (and after over 30 years), the joy of that was diminished by the burden of being an employer and the demise of manufacturing in the US. No problem! 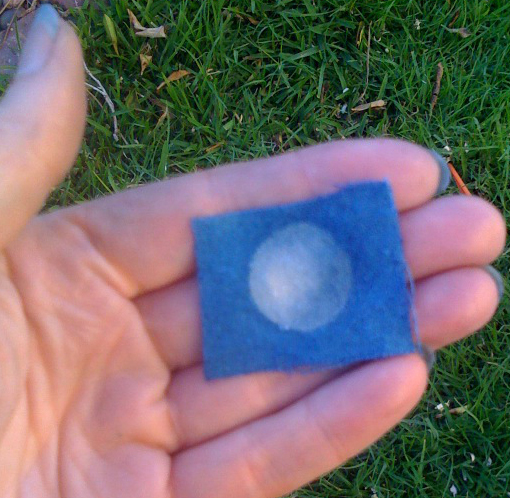 I reinvented my life as a solo dyer and continued on my way. Even my shibori ribbon has the privilege of helping support many others as they resell it or make things with it which to resell. Kinda cool. –I enjoy the interaction with customers from all over the world. I love seeing other creative folks take something I made and add it to their own work in so many ways I never ever conceived. Some of the things they make are quite extraordinary! -I wonder weekly, what comes next? Who knows? I just know that every day I get up and take the next step. I hope you do too. I enjoy the interaction with readers of this blog and the many who have followed and contributed here for so many years as I wondered, created, and thought out loud about things. So, for now, I decided to reintroduce sets of these cards in my webshop. Right now I have two collections- Shiboriscapes and Indigo Moonscapes. In the works are Shibori Flowerscapes. This will perhaps, help even out the financial ups and downs every artisan has in their flow of work and money but also it feels good to know that I will be the beneficiary of my own work as I continue to hound Amazon into removing those sellers on their site that use my images without permission. This entry was posted in business of craft, indigo, moon, photography, shibori, where to find my shibori, wondering and tagged beauty, handmade, indigo moon, shibori, wondering on June 13, 2018 by shiborigirl. Wonderful post, i’m thinking about what you wrote. you are one of those “long-timers”. I thank you for that! Thank you Susan! Shipping soon. (((Glennis))) you make good magic! Hey Mo- one day at a time. Everyday until the end. Are you giving a class at the 2018 Houston Int’l Quilt show? I still have ribbon I bought two years ago. Yes! I am. Hope to see you there!